I cannot let this opportunity pass without placing on record how much I have enjoyed my cricket with Kent. I was not depressed when they got me out. I have always taken my dismissals as part of the game. I don’t think I ever worked harder at any match during my career to get runs as I did then, nor did I ever have to face in one game such consistently fast bowlers as the Australian pair, Gregory and McDonald. In the old days we were probably educated in cricket in a far more serious way than now. It was never a policy of the Kent team that the pitch must be occupied all day after winning the toss. Lots of times I was out through forcing the game. Frank Edward Woolley was born in Tonbridge, Kent, England. He was an English professional cricketer, one of the finest all-rounders the game has seen. 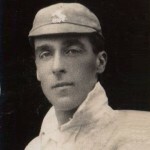 In a career lasting more than thirty years, he scored more first-class runs than anyone but Sir Jack Hobbs, and took over 2,000 wickets at an average of under 20. He is also the only non-wicket-keeper to have held more than 1,000 catches. His batting was remarkable both for his well documented elegance and his rapidity of scoring.